Information: Medieval church "modes" with Greek names (dorian, phrygian, etc.) are all purportedly creations of the middle ages. M.L. West. 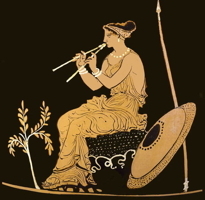 Ancient Greek Music. Oxford University Press 1992. Peter James and Nick Thorpe "Ancient Inventions" p. 607: "Written Music." "In 1893 French Archaeologists excavating at Delphi, the sacred city of the Greek god Apollo, uncovered two curious stone slabs. They were inscribed with hymns in praise of Apollo, written in the usual ancient Greek alphabet of the late second century B.C.E. But what made them different from any other Greek inscription found before were the conspicuous extra characters carved between the lines of the hymns. Much to the delight of the excavators, these proved to be musical scores, which, although fragmentary, are still the most extensive surviving examples of ancient Greek music. "Since this amazing discovery numerous other fragments of Greek musical scores have turned up, ranging in date from the mid-third century B.C.E. to the third century A.C.E. Most are on papyrus, often in frustratingly small scraps, though large enough to see that they are mainly extracts from the music composed to accompany plays, such as the famous Orestes written by Euripides about 450 B.C.E. "These rare archaeological discoveries were easy to identify as ancient Greek musical notation. Conveniently enough, one Alypius has set down a record of the classical Greek system of musical notation in the third or fourth century A.C.E. He listed the symbols used (a mixture of alphabetic and pseudoalphabetic characters), and provided a detailed explanation of their meanings. Fortunately his work was continuously preserved from classical times by the efforts of the feverish manuscript copiers of the Middle Ages. Knowledge of the ancient Greek system of musical notation was never really lost  indeed our own system of musical notation, evolved through the Middle Ages and crystallized in the seventeenth century, was ultimately inspired by the Greek example." The book includes a photo of the Delphi stone fragment and a transcription into modern notation. The authors note that there are no indications of rhythm on the original; they've written it as 5/8, perhaps feeling that the flow of the syllables fit that signature best. The text goes on to discuss Pythagoras' ideas, ancient Indian and Chinese music, and the final of the section of the chapter covers how a Babylonian song from around 1800 B.C.E. was reconstructed. Isobel Henderson "Ancient Greek Music," Ancient and Oriental Music (Oxford University Press, 1957), p.336-403. Gives technical details and examples from surviving documents. Discusses movable notes. In the scale, once defined by mode, the 3rd and the 5th move. That is, myxolydian à blues. Ancient Greek dance: Chardax, in 5/4 resembling Zagoritikos.